What's cooler than ice cold you ask? Olivia Palermo, of course! Every true fashion girl knows that no outfit is complete without the proper pair of statement sunnies, and the Olivia Palermo x Westward Leaning Rose Gold Collection is just that. 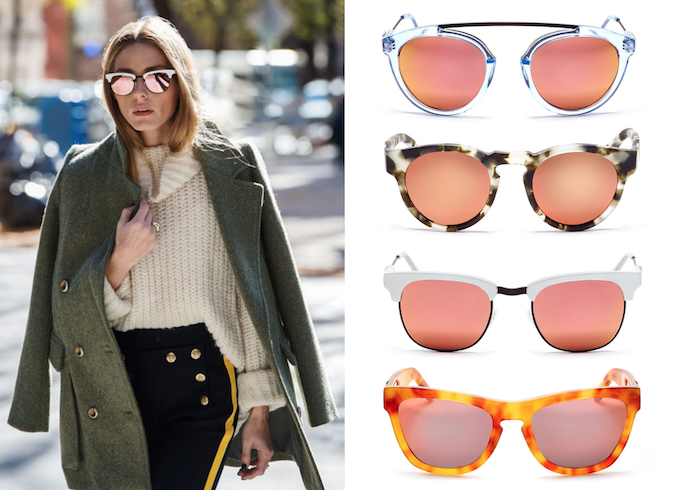 Like Olivia Palermo's street style, her Rose Gold Collection of sunglasses for Westward Leaning has just the right mix of sophistication and fashion forward edge. Both fashionable and functional, the mirrored rose gold lenses compliment every skin tone and hiding runny mascara and under eye circles in a pinch. With eight styles, there is the perfect eye-catching pair of sunglasses for every face shape, so the only thing left to do to rock the streets like Palermo is put on your favorite pair, drape your coat over your shoulders and strut. Find the Olivia Palermo x Westward Leaning Rose Gold Collection here and here.